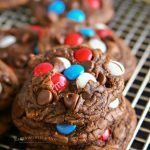 Chewy Patriotic Brownie Cookies are a soft & fudgy cookie recipe that will satisfy any brownie lover out there. 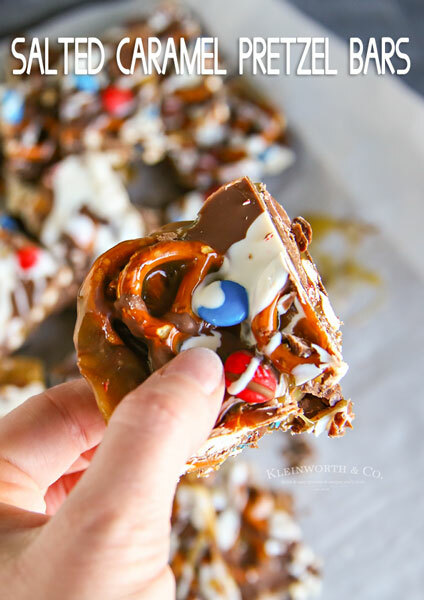 Loaded with chocolate chips & patriotic M&M’s, these will be the hit at all your summer parties. Oh my goodness. Have you ever had a brownie cookie before? I first had the pleasure of trying them years ago when we picked some up at the bakery. I instantly fell in love & swore I would make some every week. They are my guilty pleasure for sure! 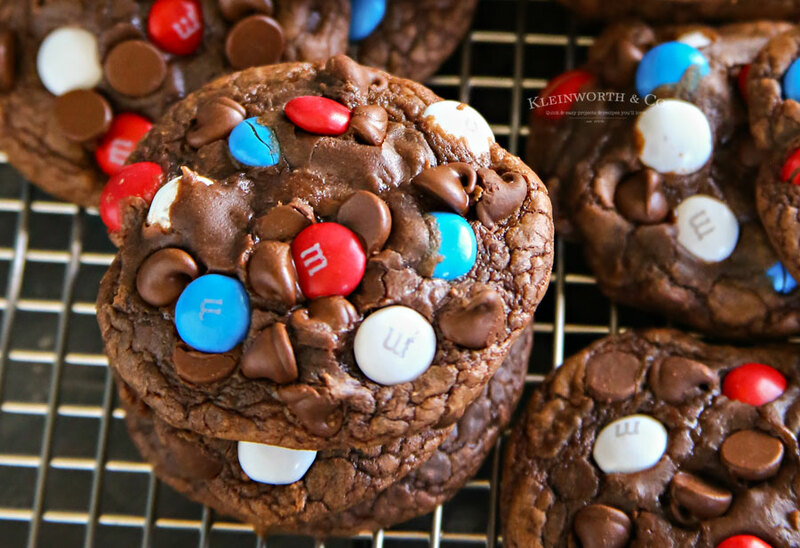 Since we are close to 4th of July & I have bags & bags of patriotic M&M’s, I decided to top this batch with them to make these Chewy Patriotic Brownie Cookies. Things tend to get a little out of control when it comes to 4th of July. I make everything I can with red, white & blue & I love it. We all get so excited when those big party-sized bags of patriotic M&M’s come out each year. I make sure to buy at least 5-6 bags to last the whole season. 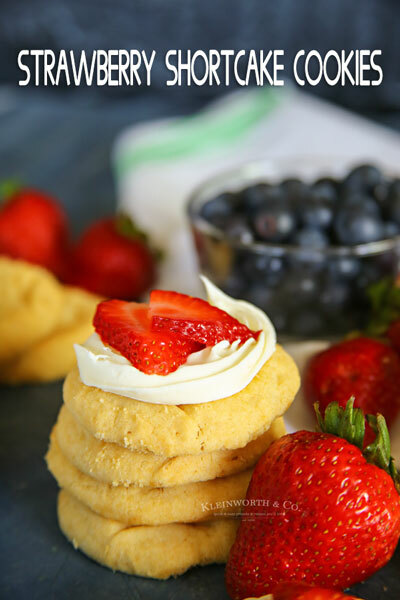 It sure makes baking for the holiday so much easier! Yes, you absolutely can. It won’t change the recipe at all. Can I omit the M&M’s? You sure can or change them up for a different holiday or event if you like. You could even use mini M&M”s if that is your preference. 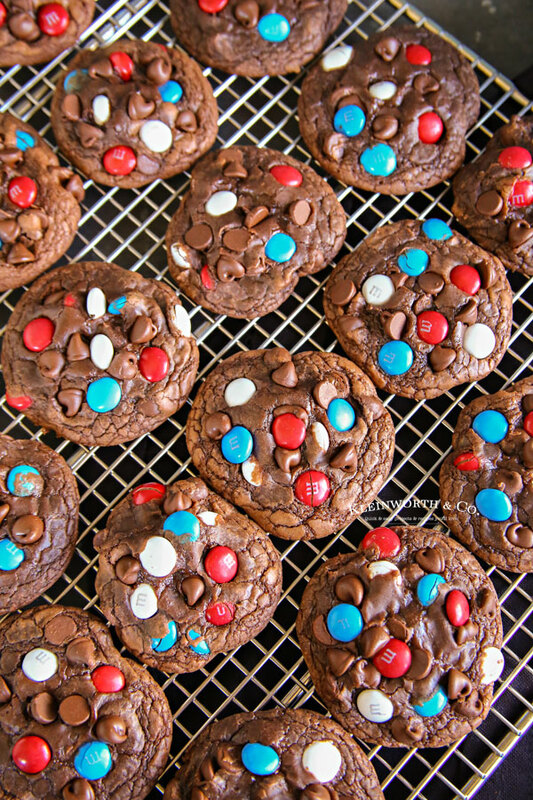 But when these cookies are warm, those M&M centers are melty & gooey. So good – I wouldn’t want to go without them. Can I add another mix-in into these cookies? Yes, that would be delicious. Maybe walnuts of chunks of candy bar would be fabulous. 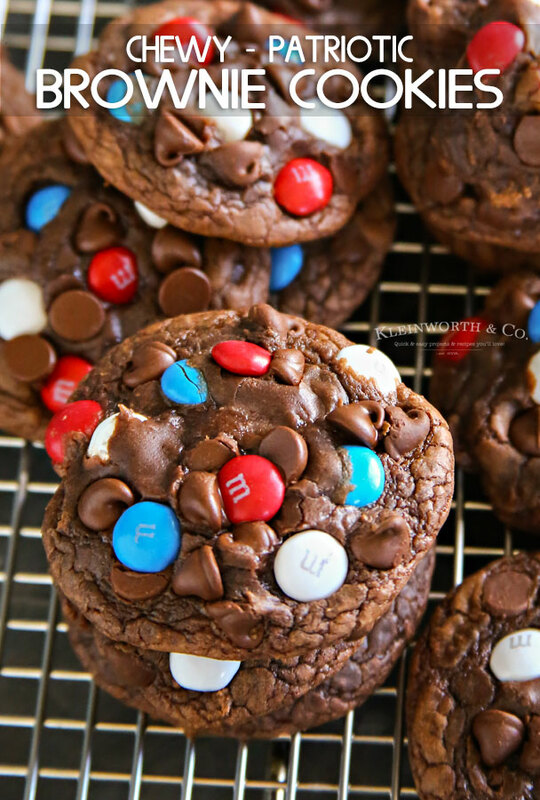 These are definitely brownie cookie heaven for the serious brownie lover! 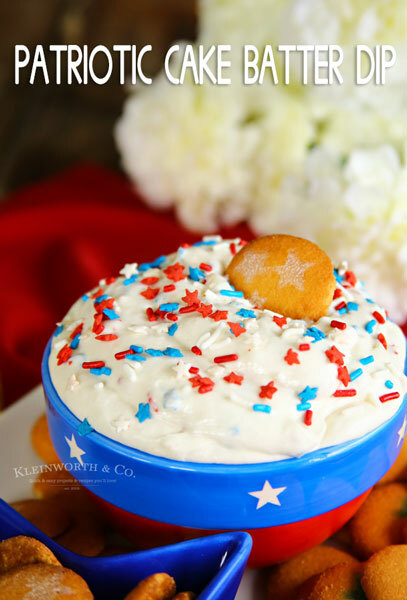 Looking for more awesome patriotic recipes for your celebrations? 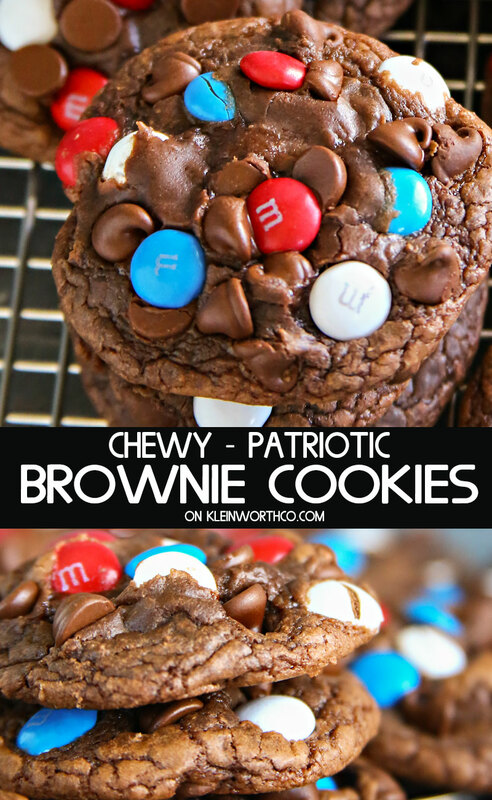 Chewy Patriotic Brownie Cookies are a soft & fudgy cookie recipe that will satisfy any brownie lover out there. 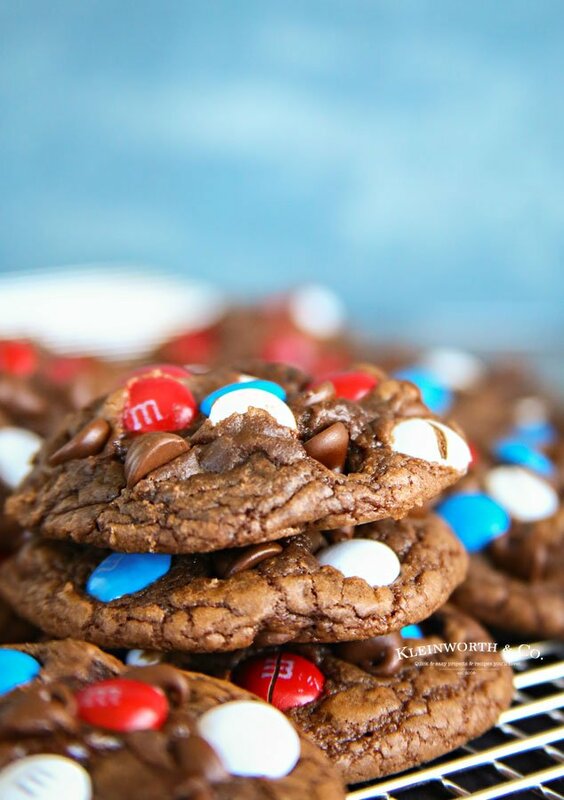 Loaded with chocolate chips & patriotic M&M's, these will be the hit at all your summer parties. Preheat oven to 375 degrees & line a baking sheet with parchment paper - set aside. In a large mixing bowl, combine brownie mix, eggs, oil & flour. Beat until smooth. When you remove from the oven, tap the sheet on the counter or top of the range to release some of the air in the cookies & give them that nice crackle top. Transfer to a wire cooling rack & cool completely before storing in an airtight container. So fun with the pops of color! Oh. My. Heavens! 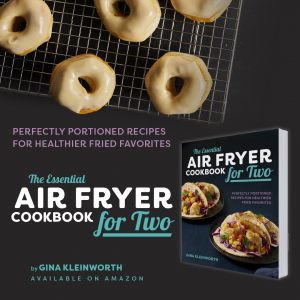 You had me at “brownie.” I’m not much of a cook or a baker, but these might definitely be worth giving a shot. Thank you. Happy Independence Day to you!